Born on 18 December 1989 in Kiyasovo, Udmurtia. 2014 — present: Biological Station Rybachy, Zoological Institute RAS. 2007–2012: Undergraduate study at the Faculty of Biology, Lomonosov Moscow State University (Diploma in Zoology). 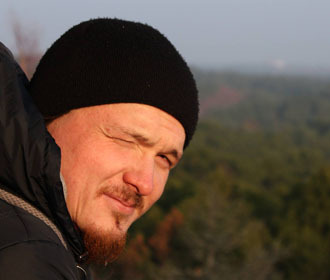 2012 — present: PhD student at the Department of Vertebrate Zoology, Faculty of Biology, Lomonosov Moscow State University. 2016: Awarded a Ph.D. on “Role of magnetic compass and magnetic map in choosing of migratory direction by songbird migrants” from Lomonosov Moscow State University, Moscow, Russia. Chernetsov N., Pakhomov A., Kobylkov D., Kishkinev D., Holland A. R., Mouritsen H., 2017. Migratory Eurasian reed warblers can use magnetic declination to solve the longitude problem. Current Biology, 27 (17): 2647–2651. Pakhomov A, Bojarinova J, Cherbunin R, Chetverikova R, Grigoryev PS, Kavokin K, Kobylkov D, Lubkovskaja R, Chernetsov N., 2017. Very weak oscillating magnetic field disrupts the magnetic compass of songbird migrants. Journal of Royal Society Interface, 14 (133): 20170364. Pakhomov A., Anashina A., Chernetsov N. 2017. Further evidence of a time-independent stellar compass in a night-migrating songbird. Behavioral Ecology and Sociobiology, 71:48. Kishkinev D., Chernetsov N., Pakhomov A., Heyers D., Mouritsen H. 2015. Eurasian reed warblers compensate for virtual magnetic displacement. Current Biology 25 (19): R822-R824. Kavokin K., Chernetsov N., Pakhomov A., Bojarinova J., Kobylkov D., Namozov B. 2014. Magnetic orientation of garden warblers (Sylvia borin) under 1.4 MHz radiofrequency magnetic field. J. R. Soc. Interface 11: 20140451. Pakhomov A., Chernetsov N. 2014. Early evening activity of migratory Garden Warbler Sylvia borin: compass calibration activity? Journal of Ornithology 155: 621-630.